#Domainer tribute : Gigantic statue of Rick Schwartz erected in #India! 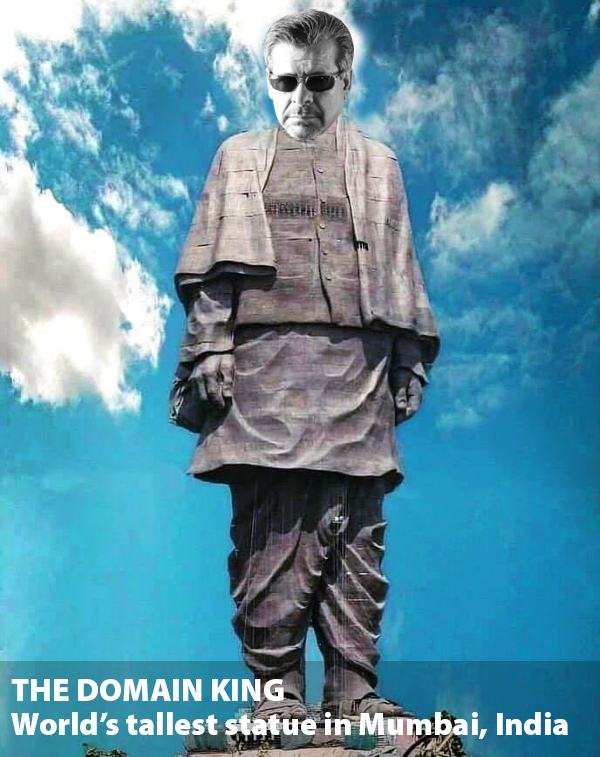 :DomainGang #Domainer tribute : Gigantic statue of Rick Schwartz erected in #India! Indian domain investors have erected a gigantic statue of Rick Schwartz in India. The 888 foot iron structure is the world’s tallest statue, and the only one dedicated to a domain name investor. Costing almost $3.2 billion dollars, “The Domain King” is located along a busy intersection in Mumbai, India. “We are absolutely delighted that Mr. Schwartz honors our country with his immense persona, and we are deeply honored as domain investors in India to have his statue guide us with wisdom,” said the project’s manager, Pittal Kettal. Weighing a little over 84 million lbs, the structure is formed with iron metal core, cast over steel reinforced concrete; the surface is polished and visitors can go all the way up to the statue’s head, where a cafeteria and resource library is built, with a tremendous view of the city of Mumbai. If you visit Mumbai, India, this is the time to pay your tribute to the Domain King statue, depicted below.